Bullion flowers - Starfish - What went wrong? 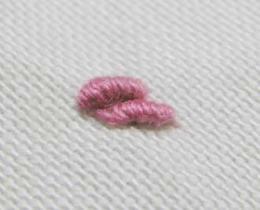 I'm guessing that you either love or hate bullion knots, would I be right? This is one of those occasions where the right tools for the job really do make it easier, and result in a neater finished stitch. So what do you need? The right needle! Most hand embroidery needles are wider at the eye end, which makes working a perfect bullion rather difficult. By using a straw or milliner's needle which is the same thickness beside the eye as it is for almost all of the rest of the needle, bullion knots suddenly become easier. You can use a wide variety of threads for this stitch, with thicker threads resulting in larger knots. 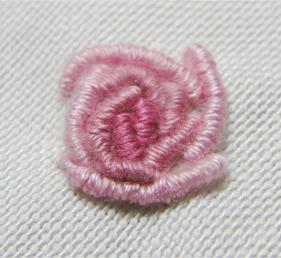 Tiny roses worked in one strand of embroidery floss have a charm all their own, but chunky ones in soft wool just invite you to touch them too. The glorious sheen of bullions worked in rayon are an important part of Brazilian Embroidery, and the slipperiness of this fibre actually makes the stitches simpler to execute. I have to admit I struggled with bullions until I watched an experienced stitcher actually working one and asked for tips. 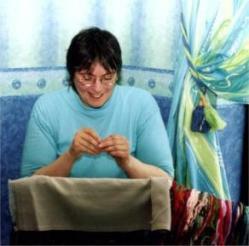 The most useful information she gave me was how to hold the needle and fabric. Suddenly it all came together and I found the stitch much easier to complete. 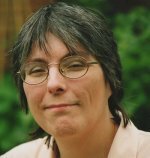 Here, I will try to put her instruction into words to help you find your own eureka moment. The stitch really is worthwhile persevering with as it can be used in so many different ways. Bring your needle up through the fabric at one end of your bullion, then take a "bite" of fabric on the needle from a short distance away coming back up in the first hole. The length of this bite will vary depending on the thread you are using and the length you wish your bullion knot to be. I am using the darkest of three shades of pink for this stitch as it will end up being the centre of a bullion rose (see below). This next photo illustrates the way of holding the needle and fabric that I was shown, resulting in my being able to produce neat bullion knots. Push the needle three quarters of the way through the fabric, then fold your work level with where the point of the needle exits the fabric. If you are right handed, place your right thumb in front of the needle, and your index finger behind it, with the needle pointing up at the ceiling. 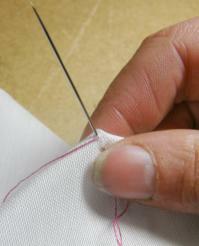 Your index finger will help to hold the thread wraps in place in the next step. 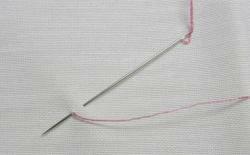 Hold the thread in your left hand and start winding it around the needle in a clockwise direction. 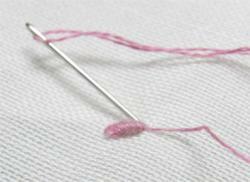 After about six turns, slide the wraps down the needle to the fabric and hold them with your right index finger. Then continue wrapping until you have enough wraps to create the stitch length you require. To check this you can lay the needle down in the direction the stitch will lay to see if the wraps will reach. Don't skimp, if in doubt add some extra wraps! 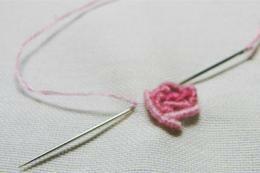 The next step is to hold the pointed end of the needle with your left hand and gently pull it through the fabric using your right thumb and index finger to ease the wraps off the eye end of the needle. It helps if you haven't wrapped too tightly! 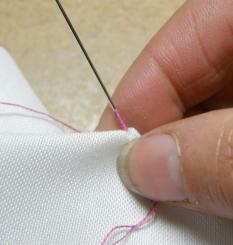 When the needle is free of wraps, pull it through until the knot lays on the surface of the fabric. Smooth the fabric flat on your table or work surface and smooth the knot into position using the needle underneath the wraps until it sits just nicely where you want it. Ensure the working thread is pulled right through the knot and then plunge the needle through the fabric at the very end of the knot where the thread already passes through the fabric. To make a bullion loop, wrap the thread more times than will fill the gap between the needle's entry and exit points. The stitch will then coil round and make a loop. 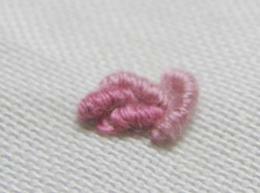 In fact another name for bullion stitch is coil stitch. It is also known by the descriptive term caterpillar stitch. If you make a long coil then couch it down near to each end the middle of the stitch forms a little hump that can really look like a little caterpillar. Pick three toning coloured threads and start with the darkest. Work two bullion knots side by side. Change to the medium toned thread and work longer stitches surrounding the centre two. Think brickwork here, and overlap each stitch so that they don't all begin and end at the same places. Work your way around the centre creating overlapping knots. The knots in this "round" will have more wraps than the centre two. Change to the lightest toned thread and work a third round in the same manner. I used two strands of floss for this final round. Wrap enough times for each stitch so that you make a loop that will sit outside the existing stitches. This photo shows where the next stitch in the rose will be placed. This photo shows my finished bullion stitch rose. If the stitches in your last round are quite long you can use 1 strand of floss to couch them so that they lay where you want them too. Finish your rose by adding a stem and leaves. This photo shows some bullion stitch strawberries I used as a seam treatment on my strawberry crazy quilt block. Using 1 strand of red stranded cotton, work two bullion stitches end to end. Then build up the strawberry shape working further "rows" down towards the tip of the berry. Try to overlap each stitch in the centre of the strawberry so that you do not get an empty channel down the middle. I used from 6 to 8 bullion knots for each berry. Then using a single strand of green work three or four knots at the top for the calyx. For a natural look you can overlap the berry itself with some of these. Remember to wrap enough times to make a loop that will sit comfortably above the existing stitches, too few wraps will make the stitch sit too tight and squash the berry. Each strawberry then needs seeds worked in light yellow or black thread. 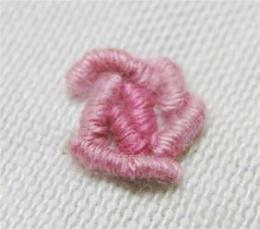 These can be french knots or little tiny seed stitches on top of the bullion coils. 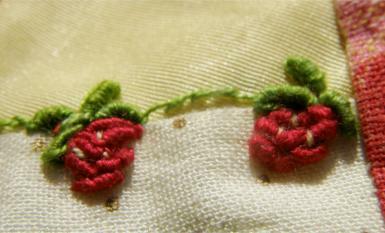 I finished my seam by using stem stitch in green to create the stems joining the strawberries together. 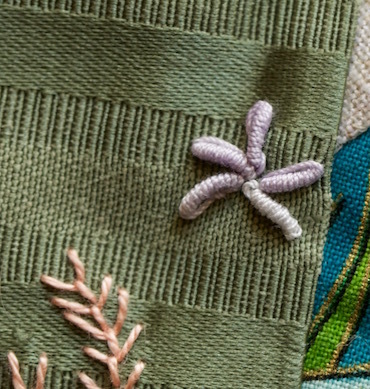 This photo shows more crazy quilt embroidery and the white bullion knots making the petals on the flower are surrounded by detached lazy daisy stitches, a form of chain stitch embroidery. 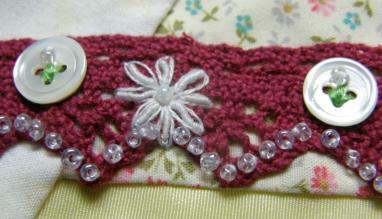 A tiny clear seed bead is attached to the centre of the flower to echo those stitched along the edge of the lace. The bullion flowers alternate with mother of pearl buttons stitched on with green thread and another bead to represent yet another flower. You could even use bullion stitches to attach the buttons! I hope this page has shown you the versatility of the bullion stitch and helped to teach you that they are not as difficult as you may have always believed. Have fun and share your results, I would be delighted to see what you come up with. Five bullion knot stitches arranged in a circular fashion can create a simple starfish motif. I used these on an under-the-sea crazy quilt block..
Crochet thread and a silk twist produced a nice smooth effect to these motifs. This next photo shows what a bullion stitch-gone-wrong looks like! Do you see the loose threads alongside four of the bullions? This was caused by the needle facing the wrong direction. 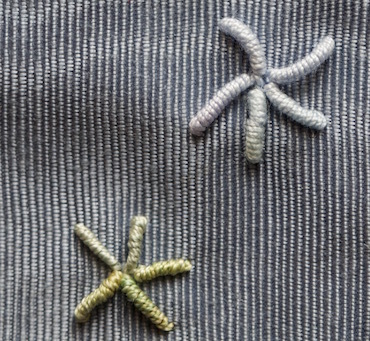 Instead of coming up in the same hole at the center of the starfish each time, I came up on the outside, leaving this extra piece of thread showing. If you find this happening, at least you will now know why and how to prevent it.